What to do With all the Strawberry Runners? 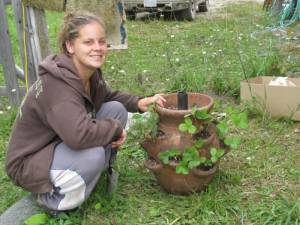 Do you grow your own fruit? 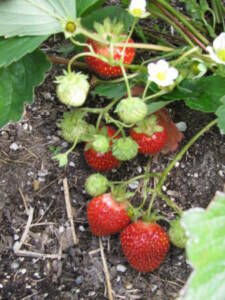 Growing your own berries isn’t difficult and will be much cheaper than buying fruit from the store. We’ve had strawberry beds every since we moved here in 2006. We added a lot more composted manure to the strawberry bed this year and it shows! We have had runners going willy nilly and they are beyond getting out of control. The strawberry bed sometimes suffers here; we’ve got so much else going on that it’s a bit easy to get overlooked. As long as we get in there and remove most of the suckers, we’ll end up with nice large fruit. planting some of the runners into this large Strawberry Pot! The pipe standing up in the middle is for watering. It probably won’t take long for the plants in the top tier to hide the pipe. 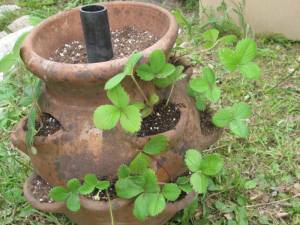 Strawberry pots like this are fantastic for on the patio or any other small garden space. 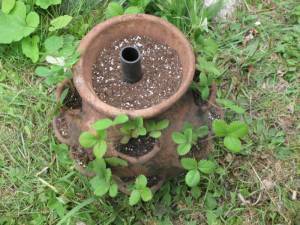 You can get a lot of strawberries from one of these pots!